The Hotel Mastino is one of the only hotels in the center of Verona that has a true Spa, situated just 150 meters from the hotel and easily reachable on foot. 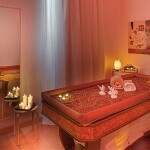 Choose from our wide selection of massages or just relax in our wellness centre. A modern wellness center, featuring a complete range of services and a Beauty Center, the Paradise Spa Mastino offers a moment of relaxation to dedicate just to yourself, including a Finnish sauna, Jacuzzi hot tub for 8 people, Kneipp facility, a whole range of beauty treatments. 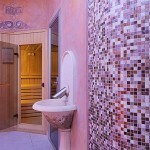 The spa also offers a salt room, which consists of a room caked in salt into which iodised Himalayan salt is sprayed. This is specifically intended to provide beneficial effects for the respiratory system and the skin.